Like all products of the Marat d'Avignon brand, this double oven mitt is made with particular care. The isothermal polyester lining contains thermal insulation that enhances heat resistance. The coating is 100% cotton, made of quality fabric, and the pattern is placed. The finishes are neat. A thin edging borders the top of the glove and ends in a loop to allow hooking. You can hang it within range when cooking. 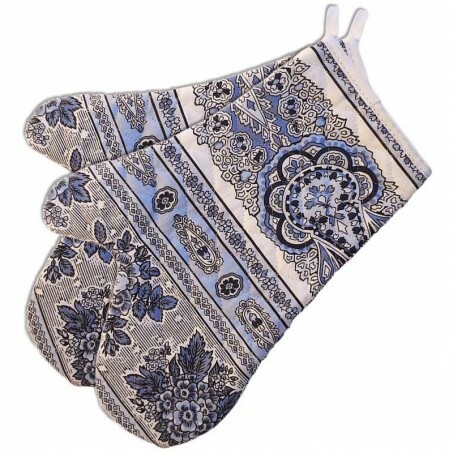 The print of this oven mitt set is a mix of floral friezes and paisley patterns very traditional in Provence. 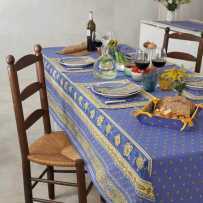 The table collection consists of round, square or rectangular tablecloths, with a pattern placed, or framed for some. They are declined in simple cotton or with a coating allowing to erase the spots easily. Next to tablecloths, quilted placemats and mats are available in rectangular or octagonal shapes. The placemats are still available in two versions of fabric: stripe or all-over framed. It is a large, really elegant table line that deserves a visit for its beauty and quality.